1.Once you've opened up the picture that you want to add the text to..
By placing your mouse on the small circle thats inside the coloured outer circle you can drag the small circle around and watch the clours change. Once you've got the colour that you want your text click OK.
Now Click anywhere on your picture,doesn't matter where,then type in your text,then Click APPLY. 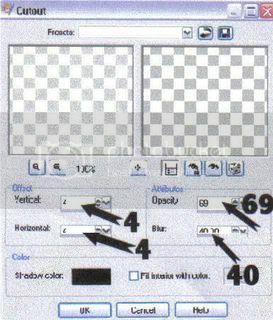 6.Now if you run your mouse slowly along the text you'll find a place where the A and cross changes into a 4 way arrow cross,thats the tool you need to move the text so when you get that 4 way arrow left click the mouse and drag the text into the place on the pic where you want it positioned.Then Click CTR AND D on your keyboard to deselect the text. 7.If you want a Shadow for your text goto EFFECTS..3D EFFECTS..DROP SHADOW. At the top of the Drop Shadow box is a curly arrow,click on that to default the shadow settings.That way you dont have to worry about mucking anything up,and you can play with the vertical and horizontal settings to get a effect you like.then Click OK.
8.Now if you goto ADJUST..ONE STEP PHOTOFIX The Computer will adjust the Font to one it thinks is more suited to the pic,if you like the change then great,if you dont then just click UNDO. 9.Now goto LAYERS..MERGE..MERGE ALL FLATTEN. 10.Picture finished,now ready to SAVE. 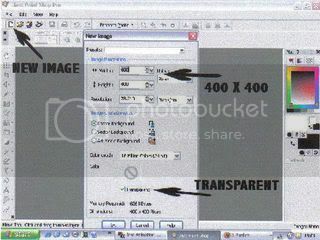 When you goto FILE..SAVE AS..CLICK ON THE SAVE AS TYPE Down Arrow,then you can choose to save the picture as JPG or GIF. I hope this helped a little to get used to PSP 9. ESSEX, I JUST LOVE YOU!! !...LOL OK , THIS IS MY VERY FIRST ATTEMPT, SO WHAT DO YA THINK??? 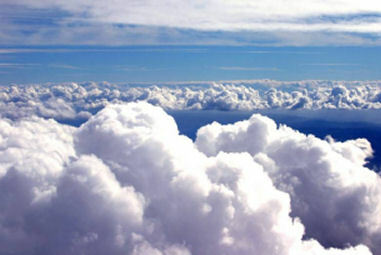 ITS LIKE I AM HIGHER THAN I HAVE EVER BEEN!! !...LOL THANKS FOR THIS TUT AND THIS THREAD!! PLEASE I ENCOURAGE ANYONE WHO WANTS TO ADD TO THIS THREAD WITH ANYTHING THEY KNOW HOW TO DO ON PSP9, TO PLEASE ADD, AS EVEN THE SMALLEST THINGS MAKE PEOPLE LIKE MYSELF SOOOO HAPPY WHEN WE LEARN HOW TO DO IT!!! ALL MY LOVE ESSEX AND TO EVERYONE!!!...WITCHYREDROSE. For a first attempt it looks really good. If you go to Society now lil ms grouch has just made a thread for a free full version of animation shop 3. Well Thankyou soooo much!!! 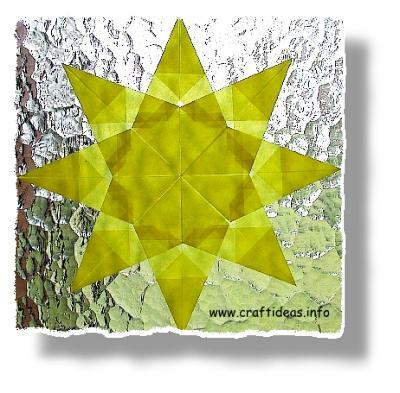 I have gone to the thread from lil miss grouch, and now I have both psp9 & animation 3, I am soooooo looking forward to your next tutorial, cuz I luv sparkles!! !...lol Thankyou for all your help!! You've be the best!!!!....Witchyredrose. Well the sig pic I have now and the one I had right before this one, I did the text on with psp9. Although I did it a bit different. Am gonna try this way to see if I can change a few things with it! Thanks Essex, this is great!!!!!! 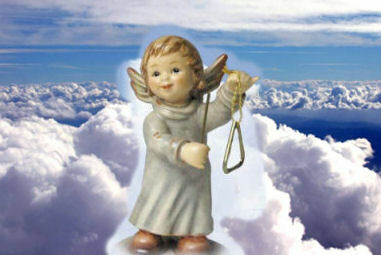 I'll use these 2 images to clone the Angel onto the other picture. 1.Open the 2 pictures up so they are 2 seperate images. 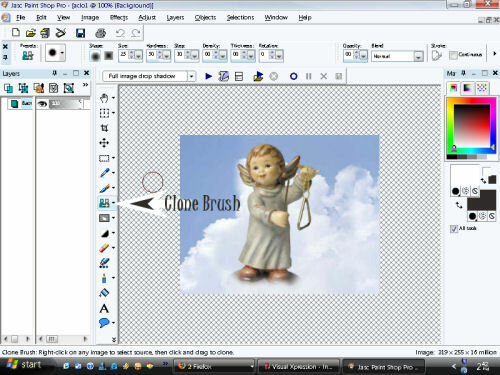 2.Click on the CLONE BRUSH,You can then adjust the size,the smaller the pic to be cloned the smaller size needed,I'm using 10 for this part.The lower the Opacity you use the more transparant the clone picture will be. 3.Now right click on the Picture that you are going to clone onto the other. 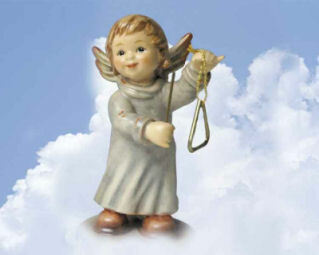 So I'm right clicking on the Angel. 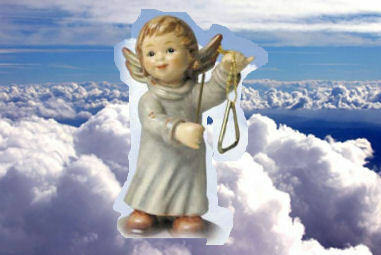 4.Now open the picture that you are going to clone your picture onto. Hold down the left click on the mouse and paint the picture into place. 5.You now could end up with something like this. Now to get rid of the areas that you dont want,goto VIEW..ZOOM..ZOOM IN MORE..place your mouse onto the part of the picture that you want to copy,left click then clone over the excess picture.Once you get near to the picture make the size smaller so you can get more accurate. If you make any mistake then use undo,once it's finished goto VIEW..ZOOM..ZOOM OUT MORE. If the blending doesnt look right then clone over the part you dont like. Once finished save the picture. This is also the way that you get rid of parts of a picture that you dont want on your signature. 1.Open up the 2 images that you're going to use as seperate images. I'll be using these two. 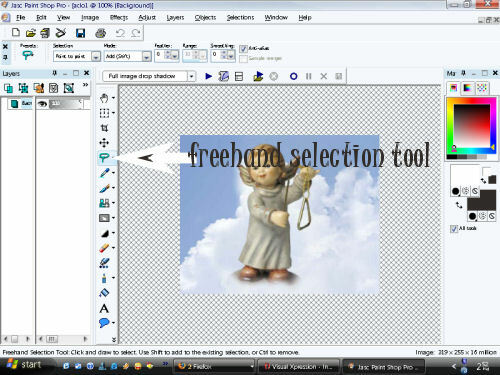 2.Click on the FREEHAND SELECTION TOOL. 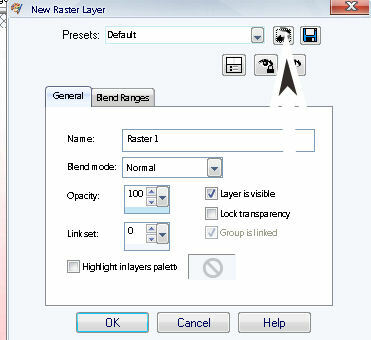 If the freehand selection tool isn't there use the down arrow to choose it. Now goto the image that you're going to paste into the background and roughly cut around it. Theres no need to try to get it perfect,it still has to be edited. 3.Now goto the Picture that you're going to use as your background. Then goto EDIT..PASTE AS NEW LAYER. 5.Now goto VIEW,ZOOM,ZOOM IN MORE. You can now hold down the left mouse click and rub out all the excess from the pasted picture.Then goto VIEW..ZOOM..ZOOM OUT MORE. 6.Now if you goto LAYERS..PROPERTIES. You can play around with the OPACITY. The lower the OPACITY,The more transparant the pasted picture becomes. I'm putting mine at 60. 7.Now goto LAYERS..MERGE..MERGE ALL FLATTEN. 8.Now goto ADJUST..ONE STEP PHOTOFIX. This will adjust the picture the way the computer recommends. If you like it..SAVE,If you prefer the pic the way it was then CLICK THE UNDO.Then SAVE. Essex...I love you!!!! 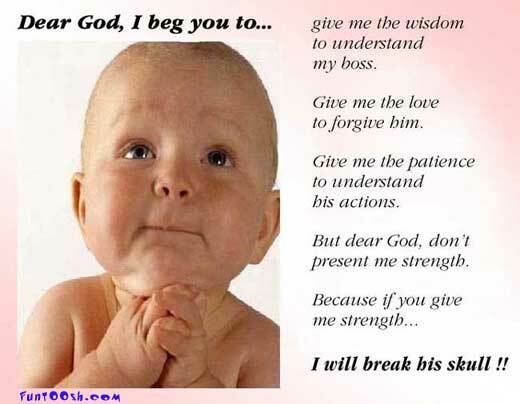 I have been silently trailing along behind everyone, but the BIG thing is I AM LEARNING, TOO!!!! I'm not at all comfortable doing anything yet, but I have been able to add my name to several pics. (For several days I couldn't even get a picture up to work on, so you can see why I'm sooo excited. ROFL) Anyway...I am s-l-o-w, but making progress...all thanks to you! I am not gonna post what I did, but I was able to do a pic that way, it just didnt turn out like I wanted it, but I will see if I can fix it up a bit better, you are a wonderful person for helping us like this! You deserve a BIG THANK YOU!!!!!! LOL,Thanks much trouble and Rainy,that makes this thread worthwhile already. This one is how to add your own watermark to a picture. 1.Open up the picture that you're going to use. I'll be using this one. 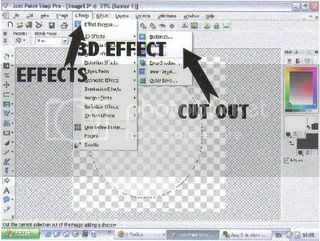 When the layer popup box is there click on the curly arrow to get the default settings. Anytime you change any settings like that one you can always get back to default by clicking that curly arrow. 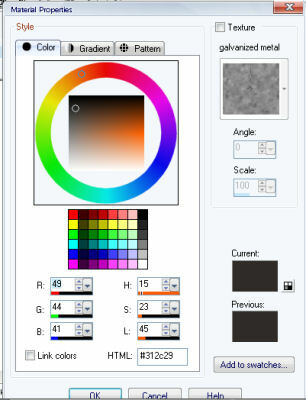 3.Click on the Text tool,make the text colour WHITE then click on your picture. 4.Type in the text that you want for your Watermark,then posistion the text where you want it placed on the picture. Then press CTRL and D to deselect the text. 6.You'll see two arrows pointing towards each other just after the eye. One up and one down arrow,drag these to the left and you'll see the watermark fade. Adjust the arrows till you think it looks right for your watermark. If you like the one step adjustment SAVE..If not UNDO then SAVE. This is my picture with my watermark. All I can say Essex is~ YOU ROCK!!!!! This one is making a globe,and saving it as a Picture Tube. It's leading on to the sparkles and learning a little about animation,but I don't want anyone getting confused and losing heart so I'll do it one step at a time. 1.You need to click on the white New Image just under File. 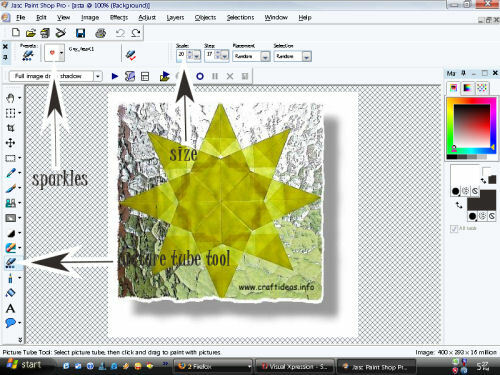 Once the popup box opens up make sure the TRANSPARENT is ticked and make the size 400 x 400, and Raster Background. 2.Now you need the select tool,with the drop down arrow on eclipse. If the rectangle select tool isnt there use the drop down arrow to select it. 3.Now begin in the center of the page,hold down the shift key on your keyboard and draw the shape for your glass globe. You'll end up with your eclipse globe shape,with the marching ants around it.we still have to make it look like glass. 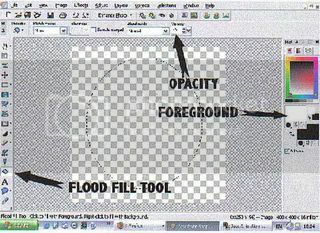 4.Now you have to use the flood fill tool,it's on the left above the TEXT TOOL. Make the Foreground setting on white and the opacity 25. 5.Now we have to turn the picture into glass. 7.Now we are going to save the globe as a PICTURE TUBE. PRESS CTRL and D..To deselect the picture. 8.This will give you a popup box to name your globe. After you've named your globe click OK and it'll save. To see what it's like to use a PICTURE TUBE open any picture. Click on the picture tube tool..It's 3 places above the text tool. 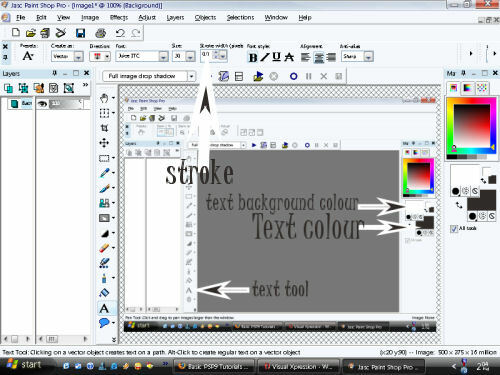 Now near the top left hand corner ..after PRESETS is a White square with the tube tool picture. Click on the down arrow on the right hand side of the white square and it'll open up to show the Picture tubes available. Put the category as ALL,and you can scroll down to find your newly saved Globe. Now that we have the globe we need to download the sparkles and the globe base ready for the animation. Both of these the SPARKLES and the BASE are all PICTURE TUBES. So they both get downloaded in the same way. 2.You will now get this..
3.Click..extract all files then NEXT. You'll now be given a browse tool. Now click NEXT The tubes will then extract then click finish. We are now going to make an animation and sparkles. I'm going to use this animation and the Globe Picture tube that we made earlier. 1.First I open the animation in Animation shop 3. This opens it up in 3 frames. 2.Now you have to goto PSP 9 and open up a new image. 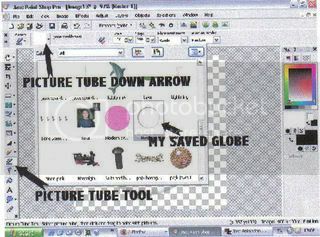 Now click on the Picture tube icon,then use the down arrow to find the glass globe you made before. 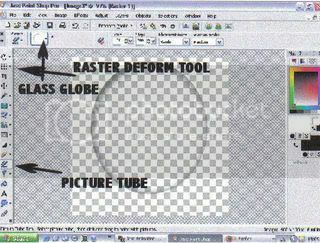 Then click Raster Deform tool to move the Glass Globe to where you want it on the pic. 4.Now you need to go to edit..copy then close the glass globe pic without saving. Now goto edit... PASTE..PASTE AS NEW IMAGE. 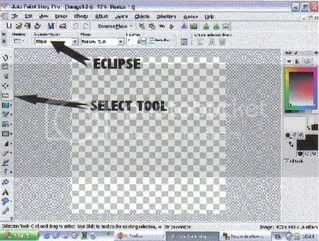 6.Now goto the select tool and choose the shape as Eclipse. 7.Now move to the middle of the glass globe and draw a large eclipse in the globe leaving some spaces around the inside. 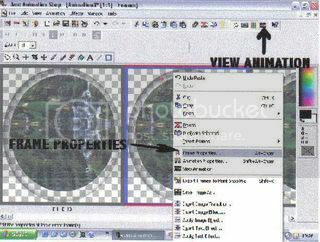 8.Now goto the flodd fill tool,it's the one above the text tool,have the OPACITY as 50,then place the flood fill tool inside the marching ants inside the glass globe and left click. 9.Now press CTRL and D to deselect the picture,then use the MOVE TOOL to get the Eclipse evenly spaced in the glass globe,then goto LAYERS..MERGE..MERGE VISIBLE. 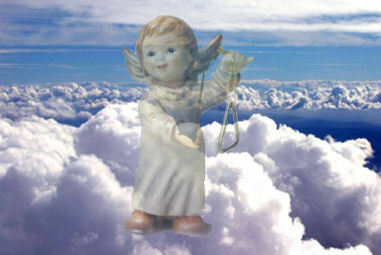 Then goto EDIT..PASTE..PASTE as new image,do that twice so that you have 3 copies of the glass globe. You'll find it in the down arrow where the select is..one under the move tool. 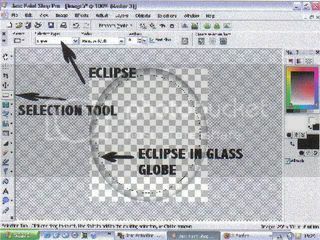 Left click with the magic wand inside the eclipse inside the glass globe then goto EDIT..PASTE..PASTE INTO SELECTION Then press CTRL and D to deselect the picture. Back to PSP 9 and the next glass globe,do the magic wand then paste into selection. 13.Back to animation shop 3,edit copy the last frame then back to PSP 9,magic wand then edit..paste ..paste into selection. Now you have the 3 animation frames all inside the 3 glass globes. You can now use the sparkle picture tubes on all 3 glass globes. Its important to only have the sparkles on the animation not on the glass globe as gifs dont accept partial transparent pictures. 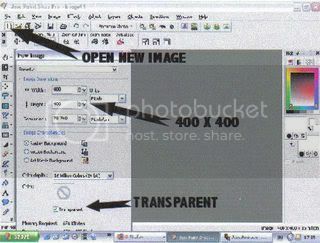 Goto the picture tube icon and find the sparkles from the drop down arrow and place the sparkles around on the 3 pictures,space then out nicely,and have different places for the sparkles on each of the 3 pictures so that when its animated it will sparkle. THEN goto the ANIMATION SHOP 3..Goto EDIT..PASTE.. AS NEW ANIMATION. The two glass globes will then be in the same animation. 17.All 3 glass globes are now in the animation. If you right click on each of the frames that will open up the individual timers and you can adapt the timers as it suits you. If you click on the view animation icon you can see your animation work. Sorry this was so long but I hope you learned a lot about both PSP 9 and Animation shop 3 from it. then edit..paste as new image,then edit..paste as new image again. 2.I now have 3 copies of the star picture. 3.Space the sparkles around and place around 10 sparkles onto the picture. If you decide to use the photofix you have to remember to use the photofix when you make the other 2 frames too. If you prefer the pic before the one step photofix then click undo and dont use the one step photofix one either of the 2 other frames. We now have to work on the second image. 7.Now space the sparkles out again and make around 10 sparkles on the picture. If you used the ADJUST..ONE STEP PHOTOFIX on the first frame then use it again now. Then goto EDIT..COPY Then go back to the ANIMATION SHOP 3. Then back to the PSP 9 for the last picture. 9.Close down the picture that you already worked on. We already have that in the animation shop 3. Now to work on the last frame. Use the ADJUST..ONE STEP PHOTOFIX If you used it in the other frames. 12.We now need to slow the animation down . It will save the picture as optimised,just click next till finish. When it asks better quality or smaller make sure it's on better quality. Essex are you havin fun? I did it!! Thank you for all the instructions, Essex! You are the greatest..